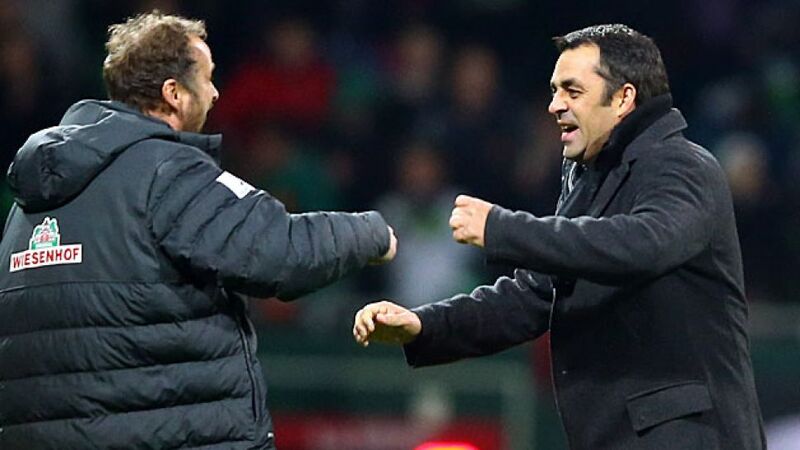 Robin Dutt (r.) says his first six months in charge of Werder Bremen have "felt like six years"
Munich - The final weekend of 2013 Bundesliga action is over and, as always, there were plenty of goals, surprises and upsets on Matchday 17.
bundesliga.com rounds up the coaches' thoughts going into the winter break. Gladbach coach Lucien Favre: It was absolutely unnecessary. We should have made it 3-1, then we go and concede the 2-2. That's really not easy to stomach, but we can't change it now. We've got to think positively: 33 points and a very positive goal difference – that's pretty nice. Wolfsburg coach Dieter Hecking: It was a fantastic game of football from two sides equipped with plenty of self-confidence. I would have preferred it if we had led 1-0 for longer, but in the end, we've been rewarded for our efforts with the 2-2. It's a fair result in view of the full 90 minutes. Dortmund coach Jürgen Klopp: We allowed our opponents back into the game today by not taking our early chances and that was unnecessary. After the second goal, Hertha gained belief and really felt that they could get something. We were too hectic at times." Hertha coach Jos Luhukay: This is incredible and it's the perfect end to our first half of the season. In the second half, we lost our way a little, but we still conceded very few chances to Dortmund. Bremen coach Robin Dutt: We fought hard and maybe had a bit of luck too, but I'm delighted for the team and the fans of Werder Bremen that we go into the winter break with a positive feeling after such a difficult year. I've been here for six months now and they've felt like six years. Leverkusen coach Sami Hyypiä: It's a bit frustrating that we've lost two in a row going into the winter break. In truth, we were in control of the game, yet we didn't score a goal. We just lacked that last bit of conviction. It leaves a bitter taste in the mouth, but we can be happy overall with the first half of the season. Nürnberg coach Gertjan Verbeek: We dominated Schalke, fought really well and gave everything. We created lots of chances, but we’ve really got to put one away now and then. It's positive when you keep clean sheets and we are making progress, but we've not had any luck yet. I asked my assistant coach 'what more do we have to do to play better?' Even he didn't know the answer. Schalke assistant coach Peter Herrmann: We can be more than happy with a point because Nürnberg had by far and away the better chances, and we were lucky. We've got plenty of players out at the moment so we're rather glad of a break. Eintracht Frankfurt 1-1 FC AugsburgFrankfurt coach Armin Veh: It was a pretty even game, even if Augsburg were always a threat. After we fell behind, we enjoyed our best phase of the game and at least got back on level terms. We're happy with a point, and we've got to be in our plight.Augsburg coach Markus Weinzierl: We played a good away game for 75 minutes, and got into the match very well, but I was not so happy with my team after we had taken the lead. We improved again in the second half, and we had an opportunity in the 85th minute which had a 1000 per cent chance of being scored. but we've drawn 1-1 and can live with the point pretty well.